Immersive rooms are multi-sensory spaces (sight, smell, hearing, haptic, taste). They are standard or adaptable, modular and fully customizable. This multi-sensory experience tool allows to measure the appreciation of a product by consumers in a given context as close as possible to reality. This innovation has won the Silver Trophy for its innovation in the data collection at the Trophées Études et Innovations in 2017 during the Printemps des Etudes (French major event). The Lab in the bag® is constantly innovating and also offers a range of sensory booths available for rental and purchase. 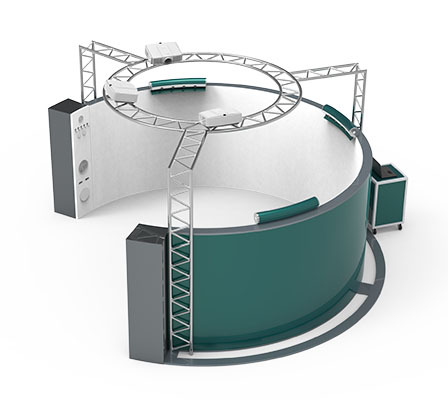 These hermetic booths guarantee strictly identical test conditions: the same test characteristics everywhere and at all times! These spaces are adaptable, flexible and very easy and quick to install. Many researches have proven the importance of standardizing test conditions: our spaces are adapted for unbiased evaluation.